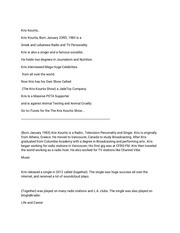 This PDF 1.3 document has been generated by Preview / Mac OS X 10.8.5 Quartz PDFContext, and has been sent on pdf-archive.com on 15/05/2015 at 03:09, from IP address 184.95.x.x. The current document download page has been viewed 316 times. File size: 578 KB (44 pages). 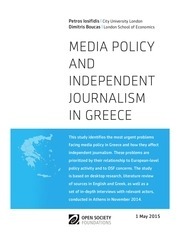 conducted in Athens in November 2014.
liberalized media ownership and cross-ownership. cautious of reporting news that state officials could find challenging. projects), and the political elite. financial crisis and the austerity measures imposed since 2010 have served to strengthen these relationships. been criticized for not functioning as an independent public broadcaster. frequencies is expected to be limited. at police hands during demonstrations. news, and dependence on big firm advertisements. be able to dismantle the old power structures remains to be seen. only temporary licenses renewed by successive governments (Papathanassopoulos, 2014a). unregulated and non-transparent media market (Iosifidis, 2007). other sectors reflect this reality. These developments have had broad implications for democracy, media pluralism, and journalistic independence. imposed by media organizations (Papathanassopoulos, 2001). digital switch-over entirely to the market. of around 280 local, regional, and national daily newspapers (Papathanassopoulos and Mpakounakis, 2010). (including Parapolitika and Sto Karfi), most of which are located in Athens (Papathanassopoulos, 2014b). the Greek Communist Party (owner of Rizospastis). publishing (57.5 percent of total turnover), the printed press (29.2 percent), and tourism (13.3 percent). well above its competitors (Leandros, 2008). television channels soon emerged through a savage deregulation process. more than 1,000 private radio stations with negligible market shares. and Melodia FM. 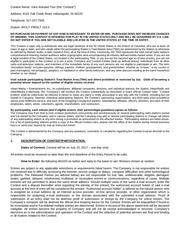 ANT1 and Macedonia TV are owned by M. Kyriakou (see Appendix 1). also have a strong presence (see Appendix 1). licenses to private stations, and supervise programs. the stations that had already entered the market without a license. of licenses, but these provisions were subsequently updated by Law 3592/2007 (see below). ministerial decisions by the PASOK and New Democracy government renewed the licenses on a yearly basis (NM, interview). examining requests for remedies for personal insults caused by mass media. (but also financial) dependence on the government. as the new government elected in January 2015 has decided not to extend the terms of the Council members. programs that are highly sarcastic about the government (AN, interview). provides that a legal entity can own one television station and have shares in (but not control) another. magazines, online), in which the physical person or undertaking concerned is active. within a group through associated enterprises. (paragraph 8) clarifies the nature of non-information resources, which may cover general targeting (e.g. the midst of the economic crisis when banks stopped giving out loans so easily. This file has been shared by a user of PDF Archive. Document ID: 00231286.